Spring is just around the corner, and so is market season! There's something grounding about shopping handmade—it's in the simple act of shaking the hands that made the products you're welcoming into your life. It's not just another necklace produced in the masses, it's one shaped and polished by Virginie. Shopping handmade facilitates a deeper connection between you and the "things" in your life, which encourages us to consume more consciously and preserve more mindfully. Louve is an independent jewelry line based in Montreal. 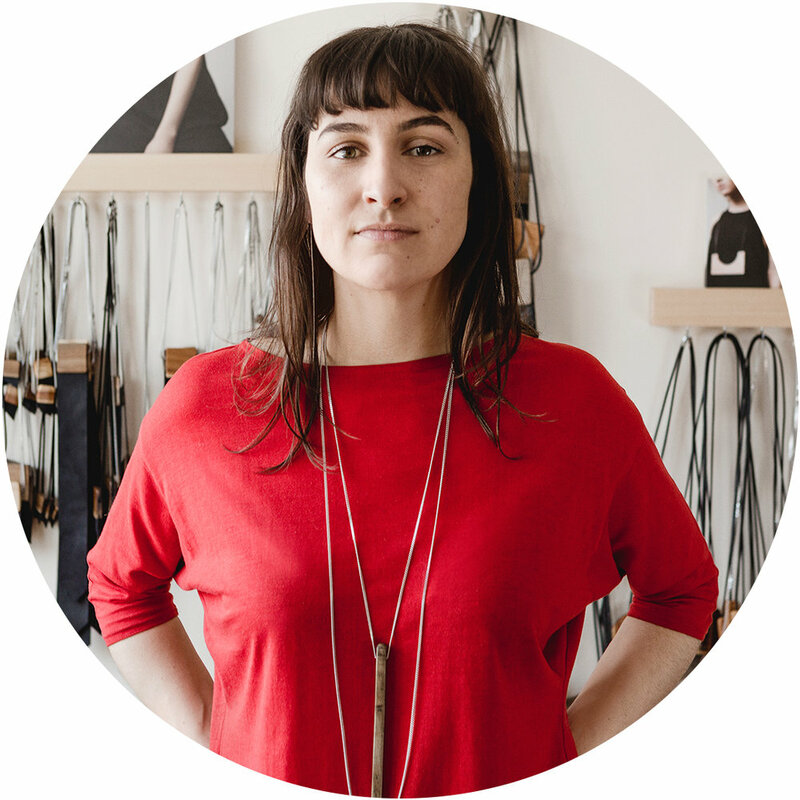 The collections are handmade and designed by Virginie Turcot-Lamarre. 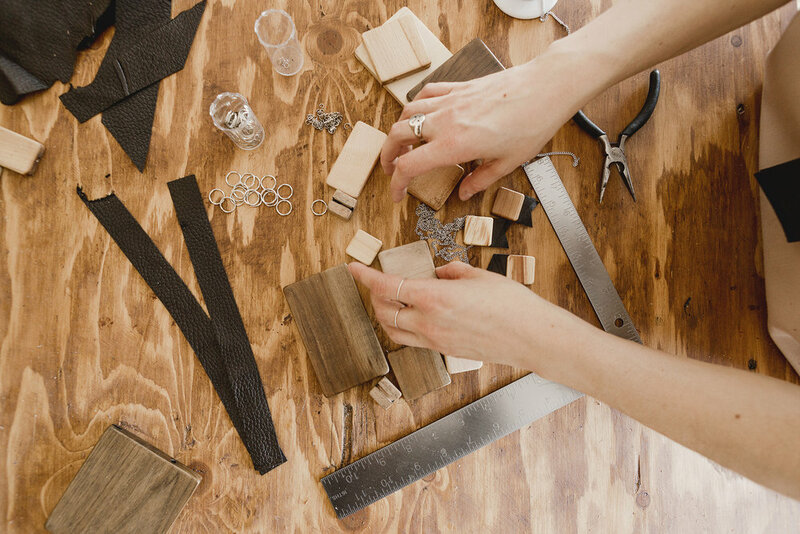 Inspired by the natural warmth of wood and leather, she uses and combines salvaged materials to produce hybrid, sleek jewels that stand out through their audacity and character. Taking shape from very eclectic inspirations, Louve jewelry is characterized by a singular and assertive minimalist aesthetic. I’ve seen some incredible Montreal designers rise out of the slow fashion movement in recent years! Can you tell us about Louve and how you got into the industry? Jewelry has kind of always been a universe in which I felt comfortable experimenting. I can say I have a very self-taught approach. I never studied jewelry, woodworking, fashion, or even design. I grew up surrounded by very creative wood lovers and got seduced by the amazing richness of wood. I started my own experimentations about 4 years ago, developing a series that would become Louve. What does Louve stand for, and what kind of products do you seek to put out into the world? Louve is the french word for a she-wolf, which I think represents my line very well—in its (natural) materials, as well as in its aesthetic and energy—feminine yet fierce and bold. I also feel like it's related to my process, because I first started my experimentations and most of my production in my father's personal woodshop, in a country house about 2 hours north of Montreal. So I was surrounded by that deep forest when I started creating this line. It felt like Louve was strongly reflecting that little bubble I started building. Were you born and raised in Quebec? How do you think the province’s culture and geography have shaped your creative journey? I was born and grew up between Montreal in a very tiny village called Entrelacs, up in the Laurentians. I guess this in-between had a great impact on my creative journey, having access to the ongoing creative urban influence of the city, as well as the calmness and tranquillity of the forest, where I benefited from unlimited access to the materials that really became the start of all my experimentations. I love this description of your work: “singular and assertive minimalist aesthetic”. Where does your work pull inspiration from? I studied Art History before jumping into the experimentations that led me to my jewelry line, and I think Louve is inspired by much of what I have seen throughout these studies. My jewelry is the result of a combination of very eclectic inspirations, but I couldn’t name them all. I have been particularly influenced by the Arte Povera movement, the very grandiose and refined aesthetic behind minimalism and american Land Art, and by the sensibility (and strangeness) of relational art practices. I think it all blended into what became a very personal series of bold, minimalistic, handmade pieces that formed a jewelry line. I like to see my pieces as hybrids, as the result of these very diverse inspirations coming together. Even though I can't detach completely from my personal feminine point of view, I am very inspired by the idea of creating a line that's mostly unisex. I like to believe that my jewelry can be appreciated by a wide variety of persons and personalities. I feel your most recent collection, Lunar Walk, really embodies that singular and assertive minimalist aesthetic, with strong focal points and smooth lines. What does this collection explore? On a personal level, I started to get interested in the lunar cycle and the many symbolics it embodies, and it got me into exploring how I could translate some of its essence into jewelry pieces. So I started experimenting with all these moon and half moon shapes, and playing with the very interesting negative shapes it created, to build this very bold and graphic series. Let’s chat about your creative process! When inspiration hits, what steps do you take to turn thoughts and ideas into these beautiful statement pieces? I am still very much inspired by the material itself, and by the natural warmth of wood and leather. I like to play with the geometry of forms and create simple but singular compositions. My designing process often starts with drawings and sketches, but sometimes it also starts directly in the woodshop, experimenting based on what the material has to offer. It looks like wood and leather have been a Louve staple since the beginning of your journey. What is it about these materials that keeps you coming back? I am truly inspired by the texture and richness of wood. To me, it's a material that stays alive long after being cut. The wood seems to preserve traces—like little memories—and at the time of making my pieces I've happened to fall upon some beautiful surprises that were hidden inside. I like to recover and highlight the details we often call "imperfections". As a result, even if I wanted to create 5 identical pieces, they will always be different. I really like the way it contributes to the uniqueness of each and every piece. When the work piles up, how do you ensure each piece still supports your slow made values? All my jewelry is made locally and in small quantities. I generally work alone in my studio, and each piece is finished and assembled, one by one, most of them by my own hands. It may be a limitation in terms of quantity, but it allows me to keep perfect track of how it's made. I like to keep it at a human scale. No matter how much work piles up, I always prefer to prioritize quality over quantity. I guess for me, part of collaborating and buying from slow makers is to accept that hand-making takes time. Aside from the OOAK Spring Show, what’s next for Louve? Are there any exciting projects or happenings you can share with us? I don't want to reveal too much, but I have been thinking of expanding my line beyond jewelry…☺ I will have lots of exciting projects and collaborations coming up in the next few months! To eventually design my own piece of clothing! If you could hop a plane tomorrow and travel anywhere in the world, where would it be and why? Kiev, for its fashion scene! For more of Virginie's work visit louvemontreal.com, or meet her in person at the show! We've got a set of tickets to give away! Join us Friday March 23rd on @makersmovement Instagram stories for contest details.